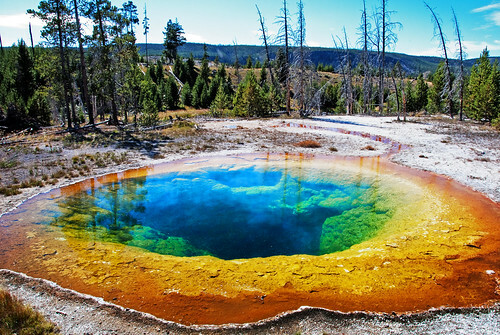 Morning glory pool is considered the most beautiful pool and a must-see of Yellowstone National Park. Its colors are because of the existence of heat-thriving bacteria making a stunning display of hues. The delicate blue water is created by thermophilic bacteria, which thrive in the pool’s searing heat. Over the years people threw coins, bottles and trash in the pool, reducing its flow and causing the red and orange bacteria to creep in from its edge, replacing the blue bacteria that thrive in the hotter water at the center of the pool. September 7, 2010, Upper Geyser Basin, old faithful area, Yellowstone National Park, Wyoming, geographic location.